This crawl space liner has anantimicrobial added to the tan layer to enhance the vapor barriers natural ability to resist mold and mildew. The GuardianLiner™ is available in 3 sizes (see below). Extremely durable, high quality crawl space vapor barrier/liner. This crawl space liner has been a favorite of the professional community since it's introduction. There are three major components that make this liner an excellent choice for the crawl space environment. First, the white top layer and the tan bottom layer are made from 100% virgin polyethylene resin. This is very important because these layers will last indefinitely. Product performance & longevity are key factors in an investment like this. The second part is the reinforcement cord in the center. Made from 100% polyester, this 1000 denier cord protect the crawl space liner from tearing. The third component is the antimicrobial additive. Although virgin polyethylene naturally resists mold and mildew, the antimicrobial additive will give an extra level of protection and piece of mind. GuardianLiner™ was engineered for the crawl space environment while most other brands are designed for uses in the oil fields, equipement covers and grain covers. The 12 Mil GuardianLiner roll size is approximately 86" for all three roll sizes. We take the wider rolls and fold them in half before rolling them on a thick cardboard core. This 12 Mil product will measures 11.5-12 mil (.0115-.012 inches) at the center of the diamond pattern and approximately 16 mil at the string reinforcement. Expect that these rolls are heavy and may need two people to carry them. Due to its large size, UPS charges a large package handling fee of $9.28 each to deliver to your door. Very happy with my purchase. Ended up buying several more rolls. Saved a ton of money buying from CrawlSpaceRepair and using some good workers. I no longer have humidity issues under the house! I can't be more pleased with the quality of these products! They've helped to convert my dark dangerous scary crawl space into an inviting area that's truly become safe and enjoyable to work in when the need comes. Thank you for providing such great products and the support to back them up. Fantastic quality at a competitive price. We have a lot of ground water and there was a bad mice infestation at one time. After laying down this vapor barrier the terrible smell completely disappeared! I ordered the 12mil barrier for my dirt floor crawlspace and so far I am very happy i did. a few days after running this on my floor and after i wiped off my water pipes i noticed they stopped sweating as bad and my floors stopped dripping in spots. The material it's self seems very tough and paired with the felt i can move around without the feel of rocks under my feet and knees. Your 12 mil. Vapor barrier is a very good product. Should hold up for a lifetime. Thsnks for your rapid delivery. I needed a thick vapour barrier for my crawl space here in Nova Scotia, Canada and couldn't find anything here in Canada. I came across crawl space repair and decided to email them for a price and shipping quote and got an email back right away, the price was definitely within budget and shipping really wasn't bad at all considering it was being shipped to Nova Scotia. I got my plastic within a week with no damage at all. If you are looking for a good quality plastic I wouldn't even shop around buy from crawl space repair I will be recommending my plastic to everyone. they sent me out samples so I could see what I was buying before I placed my order. Thanks guys. Awesome, easy to cut,no punctures after install. Tape from Crawl space repair was fantastic. If I had a little bridging with the barrier I just added another piece next to it until I got past the bridge. One of the best things I've done to my house in the past 40 years. I am encapsulating my own crawlspace. Used this 12 mil barrier throughout. It is highly puncture resistant and seems very durable. I was a bit concerned when I received the shipment of the roll that although it was 80lbs it didn't look quite wide enough to do the job. However, it's amazing just how tight they can roll that stuff as it was not only adequate but quite thick. In fact, we had to devise some creative ways of applying for long rolls. Very nice product, no smell at all, appears it will last for many years. Had lived in a house for 14 years, and the so called vapor barrier in the crawl space was relatively thin clear plastic which was torn up near the entrance to the crawl space due to HVAC and pest control people crawling over it over the years. We were putting our house on the market and wanted a durable vapor barrier that would look good and do the job for years. On a budget, we didn't want to pay the $3000 to $4000 for someone else to install, so looked for other options. We ordered the 12 Mil Crawl Space Vapor Barrier with GuardianLiner™ from CrawlSpaceRepair and have been very pleased. It arrived earlier than expected, and, with proper planning and cutting into the appropriate pieces, was easy to install. The tape worked well for connecting the recommended overlaps, and the finished product looks great. Since the house has been under contract, several people have been in the crawlspace (contractors, HVAC technicians, etc.) inspecting or making minor repairs, and all have praised the quality of the vapor barrier. It looks fresh and clean, and is clearly an improvement over the prior material. I highly recommend the product, and if you have any do it yourself skills, recommend you do the job instead of contracting it out. We did not encapsulate our crawl space, but this material would be great for encapsulation also. Just installed, but quality appears to be very good. Has met all expectations. Product shipped next day and arrived the day after that. Very pleased. Put the 12 mil barrier under my 10 yr old house. Stopped the dirt smell and the humidity problem. Awesome product. Easy to install. Recommend getting the tape that's used to secure the barrier to the wall. Ok, so it's a little hard to for sure say the product is 5 stars durable since it was just installed, but based on what it feels and looks like, I would say it seems that it is of high quality and durable. Used to encapsulate a small crawl space in a 1920s townhome. Service and delivery was great...I ordered Friday and received it on Tuesday afternoon (in Ohio)! Convenience, price, and service were great...I looked online for a comparable product / price and found nothing. If I ever need to buy similar supplies, I would definitely be a return customer. Great price, great stuff, great support staff, excellent service! I ordered 12 Mil Crawl Space Vapor Barrier for my crawl space. I compared with other seller. Some asked for $70-90 shipping cost for around $250,but no shipping cost from this seller price at all, so the price is lowest. When I tried to install on my crawl space, I found the color was black instead of white I ordered, so I sent an email to customer support on Sunday night. On monday early morining, they quickly replied me that it was protective wrap, inside is pure white what I want. Customer also made a call to me to confirm this and let them know if any more problem even it passed 30 days! Very quick response, very polite, helpful support! The vaport barrier fits excellent for my crawlspace. After installation, my crawl space is dropping from 70-80% to steady 40% in raining days with vent close ( I live in NJ)! Buying from this seller is highly recommended! I want to buy something like ground soil mat for my front yard, but unfortunately they don't carry this stuff, otherwsie, I would buy from the seller. So I bought the barrier a year ago, before I realized that I needed to dig a French drain system and core drill an outfall pipe through my foundation at my vacation home. My advice is don't plan on taking any shortcuts. Wipe down the concrete before installing the double sided tape, drill and pin the membrane as they tell you to, buy the underlaid "felt". In hindsight, I would only buy the 6.5 ft wide membrane. The 13' wide is too hard to handle with just one person. The stuff works. The amount of moisture it traps under the floor layer is significantly more than the loose laid black plastic the builder installed. I am using this on the floor of the crawl space. I haven't finished the job yet, but the material seems to be very durable and I believe it will be great on the floor. However, I spread it out and opened it up and it was upside down. I opened it in the crawl space so I have to flip it over. That is a little of a pain. This is the best product on the market in 12mil. Very easy to work with, lays down flat, tapes up easily. Clients are always impressed. HORRIBLE JOB!! But, that's certainly not the fault of Crawl Space Repair. Their products are very well suited for their intended use. I used 6 mil on the walls and 12 on the floor. i worked about 2-3 hours a day, 4 days a week on this project, and IT IS FINALLY DONE. The difference in humidity is unmistakable. You won't realize how damp your crawlspace is until you've sealed it. I still have some work to do, but the plastic is all down and the atmosphere under my house is greatly improved. Good products, FAST shipping. The product is excellent quality and simple to use. I ordered this product to save money instead of having my Basement/Crawlspace contractor purchase and recharge me as a middleman. The product came to me very quickly and in good shape. The contractor who specializes in mold and radon commented that this was much higher quality product than what his company uses. (it would have been $1000 more also). He loved working with it, and said I will never have issues with mold, dust, or vapor. Also, customer service on the phone was excellent. I would purchase from this company again. Arrived in four days. Easy to install. No odor whatsoever. Seems very durable. We had two reasons to use these materials in our crawl space: 1. Our radon level was measuring 14.4 pc/liter in our basement 2. Our house had a little musty odor when we would return from out of town trips. Our crawl space was dirt covered with pea gravel. After viewing the videos on your website I was convinced that I could resolve the above problems mentioned myself using your materials. I must say that with your information and materials we have reduced our radon radiation down to a safe level of 2.7 pc/liter and the musty odor in our home is gone. The total work took about 40 man hours but I saved approximately $4300 as a do-it-yourself project. Your materials were easy to work with and performed as you advertised. Thank you! Professionally used with outstanding results! As a high quality contractor, we take great pride in our results. The work we've done with this liner has made many homeowners thrilled with how nice a crawl space can actually be! Ultra durable for 12 mill. Some parts of my job was over sand and some areas were hardend clay. There was also an area of old block footing with some jagged edges, so I decided to use strips of 12 mill on top of the blocks for a second layer of defence. Over all I've been crawling repedly over the plastic fixing various neglected issues due to lack of motivation to crawl around on dirt with spiders and centapieds. While the sand areas are easier on the knees, even the hard jagged edges of the clay have proven to be problem free from puncture. The house now smells better and the humidity is in check!!! This is great quality 12mil vapor barrier, it is durable and works perfectly.if i had the money i would buy the 20 mil you could probably have a track meet on that stuff because the 12 mil was great! I used this vapor barrier for the foundation walls and pillars. It is much easier to cut than the thicker equivalent for ground use, which I also have. This is the same as the ground barrier, just a little thinner. They have both done an outstanding job, and now I'm waiting for the next few months to see how well they keep the moisture out of the crawl space. So far, everything is dry. My crawlspace is now awesome with this vapor barrier installed. Customer service was excellent dealing with a minor issue I had. I would definitely recommend this product and company. You can't find a better product out there! I do tons of research to find the best product. Not only is a superior product but it is also cost effective. I've been in construction for over 30 years and have seen what the standard 10 mil black plastic turns into. I found dealing with CrawlSpace Repair easy and efficient. In addition to the materials I purchased, I received very helpful advice—being a homeowner, not a professional. As to the products, the Foundation Seal Tape is absolutely excellent. Originally, I thought it was very pricey, but once I began using it, I changed my mind. This tape is great for this purpose. I used it to attach the vapor barrier to the foundation walls. Your 12 Mil GuardianLiner™ seemed very strong and should work perfectly. I’m sure there are other similar products on the market, but no customer of yours will go wrong with the GuardianLiner™. I am very pleased with both this product and with the shipping and customer service from CrawlspaceRepair.com. My order was shipped promptly and correctly. The product was received quickly and in good condition. I am very happy with the product. It is thick and strong and is provided in a convenient form-factor that made it very easy to bring into my crawlspace and unfold to cover the floor. Just finished encapsulating my previously damp, musty crawl space. This vapour barrier worked great. I was really torn initially between the 20 mil liner and this, 12 mil liner. I was concerned on the durability as I have a very rough, poured concrete crawl space floor, even though I don't use the space for storage. I wanted to avoid a high repair cost so I opted for this liner as it was on sale. I couldn't have been happier. It's very heavy duty and a extremely sharp razor knife is needed to be able to cut it. The space I encapsulated was roughly 1200sqft and around 18" in the tallest spot. Laying on my stomach and moving this liner around wasn't the easiest thing I've done but the liner performed as expected. Would highly recommend this product. Just got through laying this and am very glad we chose the 12 mil. It is a very nice product and will go under our next,property. Product was as described and worked perfectly in our installation. Happy with the product. I sealed my partial crawl space with this 12 mil liner along with the felt underlayment, foundation seal tape and seam tape. Delivery was prompt and the products easy to work with. No pvc smell at all. I should have done this years ago! I had extra so I added a second layer where I store tote bins. The seal is so tight that the liner puffed up due to air infiltration. Just wanted to share our first experience with your product. Since I'd never done this before, I really didn't know what to expect in terms of working with the product or time it would take to complete. On both scores, I would say we were pretty impressed. In this particular case, we had generally optimum conditions that will not always be present, but even so, 3 hours start to finish we had a very slick looking crawl space completed that the customer was very happy with. We look forward to working with you folks for a long time to come. Thank you again for all of your help in answering my questions to get us started. I am very happy with this liner. Combined with the foundation seal tape and the seam tape I was able to encapsulate my crawl space for 1/10th the price I was quoted by a local company. I had to level some dirt myself, but once that was done, this liner was great to work with. I wish you could smell my crawlspace now- it smells like nothing! beautiful, fresh, nothing! This product is great. Dropped the humidity from 85% to 30% almost instantly and the vents havent been closed yet. Well worth the money. I'd also add that the service was exceptional both before I bought this product and after. When I got to the job I realized that I was going to need felt. The company shipped it to me within a few days so I was able to complete the job while on site. I highly recommend both the product and the company. This was my first time using and doing a project like this! make sure to measure and cut before you bring into the crawlspace fold it up and go into space and unfold TAN SIDE DOWN, when you cut the next piece I suggest you over lap pieces by at least 3" , I was so impressed with the quality,make sure you have sharp razors to cut because there is some poly type string that runs thru it for durability a good razor will be no problem, now I know the true test will be in the coming cold months and the years as they pass to see how it truly holds up but thus far Im very pleased with this material and its purpose. I dont often write reviews but I felt compelled to let homeowners and contractors know you will not be disappointed, unless of course you cut corners and do a cheap lazy job that will be on you and not the product. I will buy again at another location and I will highly suggest to friends and family to buy! We completed our encapsulation install about 8 weeks ago on our new house, all I can say is WOW! Our encapsulated conditioned crawl space is great. It is the only way to go. 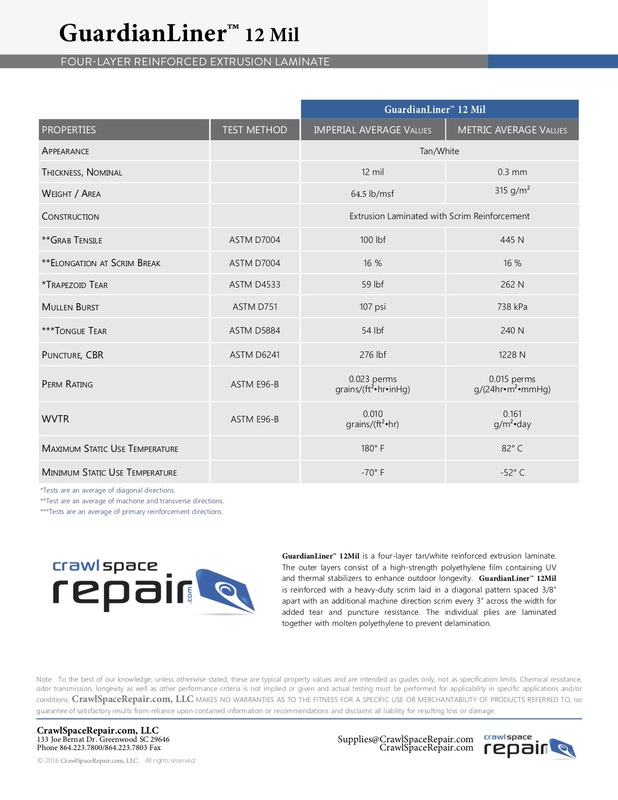 The crawl space air is clean, odor free with zero mold, and it is also critter free. Everybody that sees our crawl space is amazed. The efficiency payback is also going to be a great benefit for adding your product to our new house. I wanted to thank you, Bob, for all your help and great service! This product worked great. It came in an easy to use roll. Was very easy to put down . Within days of doing this project I noticed a big differance in the moisture and sell in the crawl space. With the 6mil used on the walls, 12mil on ground, pinned and taped, it looks and feels great. opted for the 12 mil guardian liner due to cost and it was on sale. was impressed with the thickness-yet very easy to cut. slightly difficult to work with in my tight crawlspace when spreading out and working out wrinkles. since I will not be entering crawlspace except to do maintenance--felt the thinner product was ok. In hindsight, if the area was higher traffic-would opt for the 20mil..after finishing the project, noticed several areas where small sharp objects were making indentations--not coming through..but since I wont be going in there--not an issue...overall--apples to oranges compared to the ancient plastic in there before. Best Quality for the money.Fast shipping very pleased. Would purchase again. The best product we have used for basement/crawl space systems. Performs very well and when combined with spray foam insulation creates total encapsulation for optimum performance. Customer service is both knowledgeable and helpful. We will continue to offer this product to our customers. Good products – helpful and knowledgeable service. Your company is a pleasure to work with. I bought two rolls of the 12mil anti microbial Liner. I did a 1500sq ft. crawl space and I had plenty for the job. I will use the leftover pieces to put under the tubs I will be using for storage. I will also use a piece to put down when I work under the house doing plumbing, electrical, and AC work. I am very impressed with the quality of the American made products! I have just ordered my Santa Fe dehumidifier and I am excited to see my humidity drop! I'm very happy with the 12 Mil GuardianLiner along with everything else I ordered from the website. Shipping was very fast! Great company! Perfect product for my crawlspace. I am 75 years old and installed it myself in one week-end. Received the order promptly in three days. Excellent service and good experience all around. promptly received. Well pleased with quality of the white 12 mil vapor barrier. GuardianLiner is a great product! GuardianLiner is a great product! I am so happy with this crawl space barrier. It is easy to install and is tough material. It is well worth the cost. I'm a first time home owner. My Wife complained about a musty, moldy smell in our family room located above the crawl space. I ordered this product along with the "T" pins, seam tape, and caulk. After removing the old insulation on the floor joists, I cleaned all the rocks and debris out. Then I started installing the liner right over the dirt floor in the crawl space. At first I was only going to run it up about a foot on the walls, but my crawl space was 28'x16'. That gave me plenty on material to run all the way up the walls. I couldn't be happier with all the products I purchased and most importantly, no more smell. I even ran a heating/ac duct into the middle of the crawl space and even pumping air into the space, there is no smell. Well worth the money I spent and saved. I took me four evenings after work to complete the job. Product was delivered as expected (3 days from purchase). Product was thick and fiber reinforced. I used two rolls of this product to complete the vapor barrier for an 1500 sq foot crawspace. It cost a little over $500. The cheapest install in my area was about $3500 for equivelant quality. It took about 20 hrs between 2 people. While it was hard work, it was well worth the savings and the product looks very good. I ordered the 12 Mil Micorbal Guardian Liner to cover a 400 Sq Ft. orea where addition was on a crawl. Used liner, plus foundation seal tape, and waterproof seam tape. All these materiel were superior and very easy to use. In additon, the schematics and directions they supplied us made the job a lot easier! Very happy with the product. Thanks! Great vapor barrier! The Foundation Seal Tape and Waterproof Seam Tape worked extremely well, too. My customer is very happy with the overall outcome. Heavy duty, went down easy, great product! I will use it in my own home.